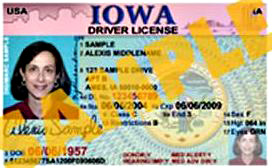 Iowa is phasing in the use of a high-tech facial recognition software for driver’s license pictures in an effort to ward off identity theft. Some states are banning people from smiling in their photos so the computerized gadgets will work properly, as the Iowa D.O.T.’s Dena Gray-Fisher says it’s a complex process. The computer software scans the picture and looks at certain points on your face, like the distance between your eyes or from the tip of your nose to the end of your chin. It stores everything in a database and then cross-references it with pictures that have similar dimensions to determine if there are enough similar characteristics that might indicate identity theft. Not so for Iowa, Gray-Fisher says, show those pearly whites. Besides, she says, it’d be pretty tough to wipe the grin off the face of a 16-year-old kid who’s just gotten his first driver’s license. She adds, if you don’t like the looks of your driver’s license photo, you have an option.